Sky Condominium is a freehold condominium located along Persiaran Puchong Jaya Selatan in Kuala Lumpur. Situated 200 metres above sea level at the highest floor with a slogan ‘Move up to the Sky’, Sky Condominium is the tallest landmark in Bandar Puchong Jaya that is developed by Pilihan Megah Sdn. Bhd., a subsidiary of IOI Properties Group Berhad. That’s not all, the residential even has a 5.8 acres of recreational space at the podium surrounded by the towers; making it a spectacular resort-liked residential. What’s even more interesting is the fact that Sky Condominium has taken the initiative to incorporate the premise with top-notch security (6 tiers). These tiers include intercom/card access system at single entry and exit point, card access system at lift lobby and lifts, digital entrance lock, panic buttons/CCTV at car park floors as well as the infrared motion detector installed at every unit. 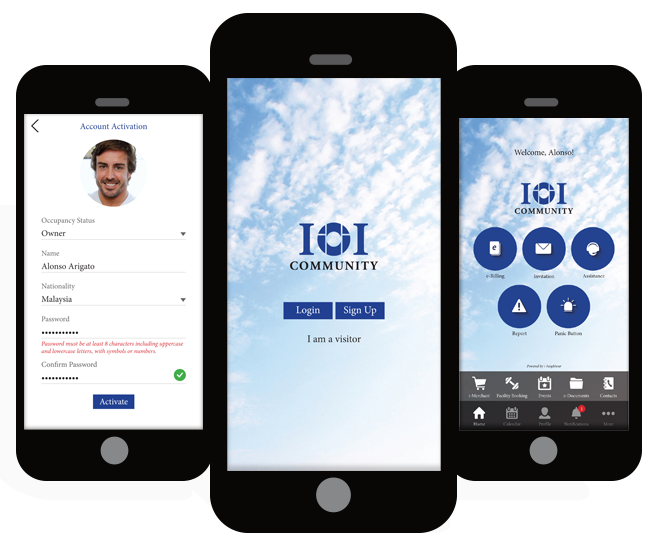 That said, the Management has likewise complimented the setup along with IOI Community App, which is powered by our ever-comprehensive i-Neighbour Smart Community System. Sky Condominium has since subscribed to over 1000 user subscriptions within IOI Community App together with our Smart Guardhouse Tablet Panel for an improved Smart Management overall. i-Neighbour is a product that is entirely made in Malaysia by Malaysians and it’s great to see that our product is being supported by one of Malaysia’s leading public-listed property developers. Visit our website to find out more about i-Neighbour.